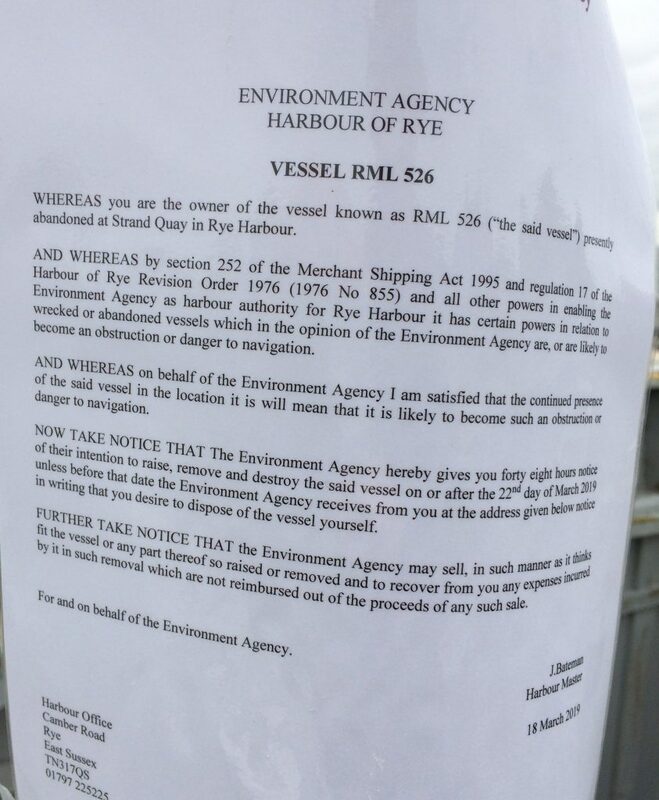 A Notice to Mariners, issued by the Harbour Master on behalf of the Environment Agency recently, notified them that vessel RML 526 had sunk at its moorings in Strand Quay and could constitute a danger to shipping. Fortunately, it had remained secured to its moorings and has since been refloated. She has lain at moorings for many years, initially undergoing work to restore her to her original WW2 profile. The cost of restoration, however, spiralled beyond even the deep pockets of her owners and for some time she has been abandoned to rot and with harbour dues left unpaid. The Harbour Master, on behalf of the Environment Agency has served notice that unless the owners take action to remove the vessel with 48 hours of March 22 (which they have not done) it will be subject to legal distraint, removed and destroyed as a survey of condition has revealed that the hull is irreparably damaged. It is probable therefore that before too long this familiar sight in Strand Quay will be removed; but before it can be disposed of, a further inspection will be required to ensure that it is free of contamination. The 112ft long vessel is of considerable historical interest. It was built in 1942 at the Solent Shipyard on the River Hamble, leading to Southampton Water, to a then revolutionary design incorporating the use of plywood in the frames of the ship’s hull. Such vessels, known as Rescue Motor Launches, were used during the Second World War on convoy protection duties and for recovering downed aircrew in the seas around Britain. 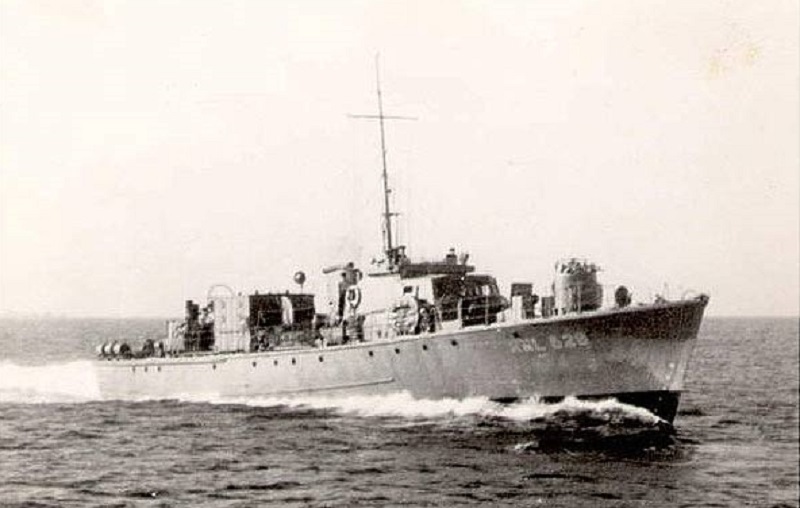 It has been reported that RML 526 was later used as a target towing vessel for gunnery practice. Decommissioned in 1946, RML 526 served in successive conversions as an ambulance launch, a smugglers vessel, a private yacht and as a ferry operating between Brixham and Torquay. An arrangement had been made with the Royal Navy to conserve the ship as only one of five remaining examples of its class still in UK waters, but sadly this fell through at the last moment. Image Credits: Charles Bronsdon, John Minter, Rye News library. This would be an awful shame – especially as I understand that the vessel played an important part in the D-Day landings. 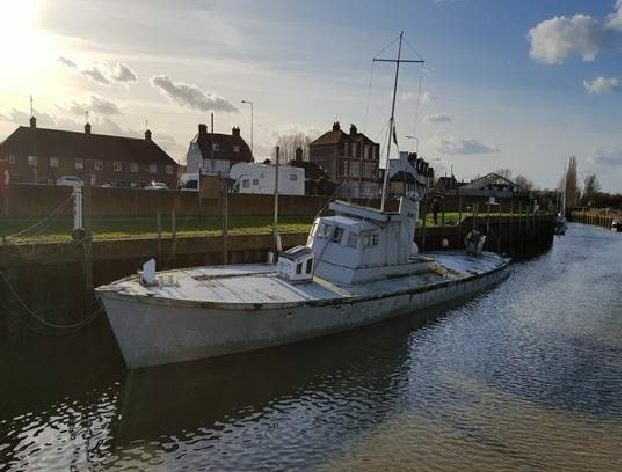 If it is no longer sea-worthy then, rather than dismantle it, couldn’t it be removed from the water, given a lick of paint, and displayed in some sort of cradle or dry-dock as a visitor attraction? So sad its a part of historical heritage, it only 1 of 5 left and its going to get scrapped,disgusting and what a waist,i dont believing its irreparable, council wants the mooring revenue i suppose. If you feel that strongly about it, why didn’t you do something to save it? I think it could be good converted as a bar and cool boozing venue. Bound to be popular! Why this unnecessary sentiment? It served its purpose; now it’s just an eyesore. I look forward to its overdue removal. At what point does sentiment end? Presumably when she becomes an eyesore Mr Southerland. Perhaps Rye Bonfire might be able to assist in her removal? More inaccurate reporting, yet again. Your picture shows RML 628 NOT RML 526! If she’s one of 4 wouldn’t a maritime society or museum take it on and do it up. Seems such a waste otherwise.